August 21, 2018, Bethany, Conn. — LATICRETE International, Inc., a leading manufacturer of globally proven construction solutions for the building industry, has acquired the remaining interest in the LATICRETE SUPERCAP, LLC joint venture to fully integrate the businesses under one umbrella and invest additional resources to accelerate growth momentum. “The LATICRETE SUPERCAP joint venture between LATICRETE and SUPERCAP was originally formed in 2012 to bring to a broader market revolutionary products and technology first introduced to the northeastern United States. Since its formation, the company has experienced excellent growth, has expanded internationally and has built an outstanding reputation for quality, speed and innovation,” saidEdward Metcalf, LATICRETE North America President and COO. The acquisition enables LATICRETE SUPERCAP to have a more concentrated and effective sales and marketing structure to spread the SUPERCAP message and promote other powerful concrete remediation products of the company across all of North America. “As the construction industry continues to evolve and slowly transitions away from traditional and inefficient construction practices, we are well positioned to deliver value-added solutions that address the serious challenges of rising freight expense, declining labor availability and ever-tightening construction schedules,” added Metcalf. LATICRETE® SUPERCAP® self-leveling underlayments are pumped into a building using a patented mobile blending unit, eliminating any dry material from entering the interior of the jobsite and the need for workers to haul and manually open hundreds of individual bags and pumping equipment. 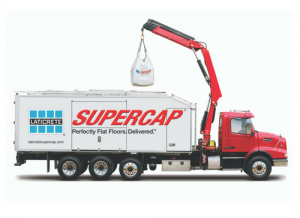 Additionally, SUPERCAP offers self-leveling underlayment Ready-Mix Delivery Service, a turnkey service that saves significant costs associated with purchasing, operating and maintaining one’s own pump truck. LATICRETE will integrate all functions of LATICRETE SUPERCAP throughout the second half of 2018 with no disruption or changes to the products or customers’ transactions. Since 1956, LATICRETE has aimed to improve the durability of buildings and create lasting customer relationships by manufacturing safe, innovative building materials and by treating customers, employees and partners like family. With approximately 1,600 team members worldwide, LATICRETE operates in more than 100 countries and distributes to every continent.